^ 1.0 1.1 1.2 1.3 1.4 1.5 1.6 1.7 1.8 1.9 della Chiesa, Angela Ottino. The Complete Paintings of Leonardo da Vinci. Penguin. 1967. ISBN 0-14-008649-8. ^ M. Kemp, entry for The Lady with an Ermine in the exhibition Circa 1492: Art in the Age of Exploration (Washington-New Haven-London) pp 271f, states "the identification of the sitter in this painting as Cecilia Gallerani is reasonably secure;" Janice Shell and Grazioso Sironi, "Cecilia Gallerani: Leonardo's Lady with an Ermine" Artibus et Historiae 13 No. 25 (1992:47-66) discuss the career of this identification since it was first suggested in 1900. ^ For a partial list of scholars who accept the attribution, see Bailey, Martin. Leonardo's Saviour of the World rediscovered in New York. The Art Newspaper. 31 October 2011 [21 February 2012]. ^ Arasse, Daniel. Leonardo da Vinci. Konecky & Konecky. 1997. ISBN 1-56852-198-7. ^ Adams, James. Montreal art expert identifies da Vinci drawing. The Globe and Mail. October 13, 2009 [2009-10-14]. ^ Kemp, Martin. Leonardo. Oxford: Oxford University Press. 2004: 251. ^ ‘Horse and Rider’ Discovered Leonardo Da Vinci Sculpture. Huffington Post. 14 August 2012 [16 January 2014]. ^ Remarkable 500-year-old Leonardo Da Vinci casting of horse and rider unveiled after original was lost for centuries. Daily Mail News. 29 August 2012 [16 January 2014]. ^ Leonardo da Vinci's ‘Horse and Rider’. BBC News. 28 August 2012 [16 January 2014]. ^ Arie, Sophie. Fingerprint puts Leonardo in the frame. The Guardian. 16 February 2005 [2007-09-27]. ^ A lost Leonardo? Top art historian says maybe. Universal Leonardo. [2007-09-27]. ^ Bertelli, Carlo. Due allievi non fanno un Leonardo. Il Corriere della Sera. November 19, 2005 [2007-09-27] （意大利语）. ^ 21.0 21.1 Stephane Fitch DaVinci's Fingerprints, 12.22.03 accessed 7 July 2009. 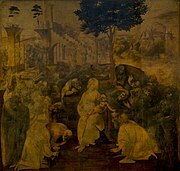 Martin Kemp, the expert on Leonardo's fingerprints, had not examined the painting when the article was written. ^ ‘Early Mona Lisa’ painting claim disputed. BBC News. 27 September 2012 [26 January 2013]. ^ The Forster Codices: Leonardo da Vinci’s Notebooks at the V&A. Victoria and Albert Museum. [4 November 2012]. ^ Paris Manuscript B. Universal Leonardo. University of the Arts, London. [3 November 2012]. ^ Paris Manuscript C. Universal Leonardo. University of the Arts, London. [3 November 2012]. ^ Paris Manuscript A. Universal Leonardo. University of the Arts, London. [3 November 2012]. ^ Paris Manuscript H. Universal Leonardo. University of the Arts, London. [3 November 2012]. ^ Paris Manuscript M. Universal Leonardo. University of the Arts, London. [3 November 2012]. ^ Paris Manuscript L. Universal Leonardo. University of the Arts, London. [3 November 2012]. ^ Paris Manuscript K. Universal Leonardo. University of the Arts, London. [3 November 2012]. ^ Paris Manuscript I. Universal Leonardo. University of the Arts, London. [3 November 2012]. ^ Paris Manuscript D. Universal Leonardo. University of the Arts, London. [3 November 2012]. ^ Paris Manuscript F. Universal Leonardo. University of the Arts, London. [3 November 2012]. ^ Paris Manuscript E. Universal Leonardo. University of the Arts, London. [3 November 2012]. ^ Paris Manuscript G. Universal Leonardo. University of the Arts, London. [3 November 2012]. ^ Codex Madrid I. Universal Leonardo. University of the Arts, London. [3 November 2012]. ^ Codex Madrid II. Universal Leonardo. University of the Arts, London. [3 November 2012]. ^ Codex Urbinas and lost Libro A. Universal Leonardo. University of the Arts, London. [12 April 2012]. Bambach, Carmen C. (编). 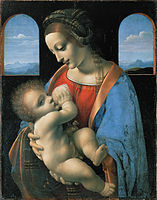 Leonardo da Vinci: Master Draftsman. New Haven and London: Yale University Press. 2003. Chapman, Hugo; Faietti, Marzia. Fra Angelico to Leonardo: Italian Renaissance Drawings. London: British Museum Press. 2010. ISBN 978-0-7141-2667-8. Kemp, Martin. Leonardo da Vinci: The Marvellous Works of Nature and Man. Oxford: Oxford University Press. 2006. ISBN 978-0-1992-0778-7. Kemp, Martin. Leonardo: Revised edition. Oxford: Oxford University Press. 2011. Marani, Pietro C. Leonardo da Vinci: The Complete Paintings. New York: Harry N. Abrams, Inc. 2000. Zöllner, Frank. Leonardo da Vinci: The Complete Paintings and Drawings 1. Cologne: Taschen. 2011.